We are thrilled to see the community embrace hydropower as a clean, reliable source of energy. 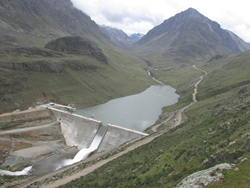 MWH Global, the premier solutions provider focused on water and natural resources for built infrastructure and the environment, announced the completion of Huanza Hydroelectric Project in the Andes Mountains of Peru, approximately 130 km east of the capital city Lima. This 92 MW project has been fully integrated into the Peruvian power grid and is now providing power to an estimated 90 thousand households. MWH provided detailed design and construction management for the project. Work first began in 1996, when MWH was commissioned to provide initial feasibility studies. The project is located at an extremely steep and mountainous terrain and the powerhouse is located at an altitude of over 3400m. The gross head, vertical distance from your intake and turbine, ranks among the world’s highest heads at 835 meters. MWH Global has been working in Peru since 1994. The company employs over 300 local staff, and the Lima, Peru office is one of the company’s largest and most successful offices. MWH Global has nearly 100 years of hydropower experience including feasibility studies, detailed design, and construction management. For more information about MWH hydro experience visit http://www.mwhglobal.com/energy. MWH Global is the premier solutions provider focused on water and natural resources for built infrastructure and the environment. Offering a full range of innovative, award-winning services from initial planning through construction and asset management, we partner with our clients in multiple industries. Our nearly 8,000 employees in 35 countries spanning six continents are dedicated to fulfilling our purpose of Building a Better World, which reflects our commitment to sustainable development. MWH is a private, employee-owned firm with a rich legacy beginning in 1820. For more information, visit our website at http://www.mwhglobal.com or connect with us on Twitter and Facebook.